I have been a professional graphic designer for 20 years and started exploring hand lettering of all kinds 2 years ago. I taught myself calligraphy, then took some classes to clean up what I was missing that couldn’t teach myself. I was asked by a friend to teach a calligraphy class at her studio and that is how I started teaching and have been teaching for a year and a half. Calligraphy for me is a fun creative outlet that allows me to create custom cards for friends and family, and a way to take a break from my work. I find it very meditative. I also run my own design studio that specializes in branding, Hand lettering and custom type murals. A deep love of nature and a need to create things have been the two consistent threads weaving through my life. Feltmaking is the perfect marriage of these two aspects of myself as the medium itself, wool, comes from nature. Although my subject matter does often reflect this affinity, sometimes I let the materials themselves represent that connection to nature while I explore more abstract imagery. I also love to incorporate other organic elements such as cocoons, feathers, stones, and branches. Most of my work involves a combination of both traditional and modern felting techniques. I love the history behind traditional, or wet, felting and the alchemy that happens as wool is transformed into felt. I also appreciate the control that the more contemporary technique, needle felting, lends when I want to pay attention to detail. Therefore I use both as I explore color, texture, and form through this versatile art form. Erin Eckenrode began weaving in 2015 after taking a workshop with world renowned textile artist, Natalie Miller. Eckenrode enjoys combining her love of textiles with exploring the use of colors in unique and surprising ways. She enjoys bringing a modern twist to this ancient craft using many locally grown, spun and hand-dyed fibers. Eckenrode creates these one of kind hand woven tapestries out of her home in Granville, Ohio. Hello, My name is Carrah-Anne Aldridge and I am a 23 year old artist located here in Ohio, USA. My popularity is growing on social media sites including Instagram and TikTok where you can find my illustrations, realistic portraits and Starbucks cup designs. During the fall of 2015, my Starbucks cup designs went viral. They were featured on Huffington Post, Mashable, Yahoo News UK, Teen Vogue, Cosmopolitan, BoredPanda, and many other sites. They were also published in a book titled, “Ripley's Believe It Or Not - Wild and Whacky 2017.” Since then, my page has grown to over 500,000 fans. The materials I use vary from Crayola® supplies, to Sharpies®, to Prismacolor Pencils and Copic Markers—which is what I use the most. I also like to do drawings with sketching pencils and charcoal. A dream come true as a young person to study at Columbus College of Art and Design. Sharing art time with her sons has also made for precious memories. She has used art for encouraging others as her career. She exhibits her work in galleries and has been teaching folks of all ages for more than 15 years. She is also member of Worthington Area Art League and Central Ohio Plein Air. Maddy Fraioli is an Oxford and McGown Certified Instructor, as well as a licensed K-12 teacher. For the past decade she has been working with K-12 students in various Summer Arts Enrichment programs in Muskingum County and Perry Counties, and is excited about having the opportunity to teach at the Newark Cultural Arts Center. Passing on Folk Art Traditions to future generations is a contribution that Maddy understands is an essential link to our own culture as well as appreciating those of others. Anne Balogh is an Ohio native whose lifelong love of art is balanced by her interest in conservation and science. Her B.S. 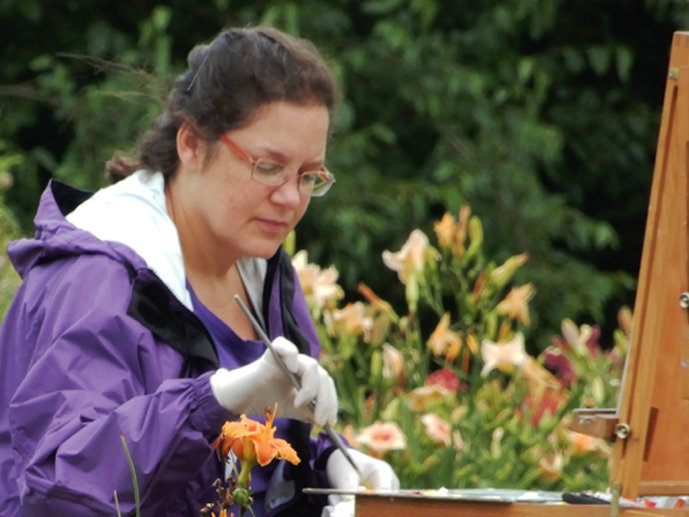 in environmental science was received from Allegheny College with a minor in studio art. She also received a M.S. in biology from Towson University. In her career, Anne has travelled around the United States working as a biologist and educator for a variety of organizations, including the Smithsonian, the National Audubon Society, and the Yellowstone Association. Recently, Anne has decided to pursue her art seriously. She gets her artistic inspiration from nature and her experiences as a biologist. Her medium of choice is watercolor, and she is currently working on a bird series that combines detailed illustrative elements with loose, expressive washes that suggest rather than depict a background. She also is dedicated to promoting conservation and environmental education through her artwork. She is a Signature Member of Artists for Conservation. Based in Vancouver, Canada, the Foundation represents the world's leading collective of artists focused on nature and wildlife. The organization's mission is to support wildlife and habitat conservation, biodiversity, sustainability and environmental education through art that celebrates our natural heritage. Locally, Anne’s artwork has been displayed at 3060 ARTWORKS in Columbus and 43023 in Granville. She also was awarded the Charley Harper award from the Environmental Education Council of Ohio (EECO), which is given to an artist who has made a significant or outstanding contribution to environmental education in Ohio through various forms of art. Amy Clark Rine is an expert seamstress with 25,000 hours of sewing experience. Those hours began when she learned how to do hand sewing before kindergarten. At age six, Amy inherited a ‘real’ Singer Featherweight sewing machine from her great aunt Daisy and the story goes on. She participated in 10 years of 4-H, went to college for fashion merchandising, sewed for two children and then worked in the home décor and toy industry for 14 years. So you could say, sewing was a personal addiction for Amy. At other times, she managed the sewing process professionally. Too many projects to count, three patents and many products later, she still loves sewing. Currently, Amy does product development projects for small companies, photography samples, mini-production runs, sewing classes AND alterations. Amy has done so much sewing; alterations come easy to her. Amy is a perfectionist and very practical. She believes “all things are possible, all things are fixable”. Kim Semler has a degree in both Fashion Design and Textile and Surface Design from Moore College of Art and Design. She has been a professional Sweater Designer for over 18 years, working on brands such as Abercrombie & Fitch, Aéropostale and Lane Bryant. Kim weaves at home on her 40” Leclerc floor loom and is currently working on a project combining different traditional rug weaving techniques using silk ribbon and alpaca yarns to create a unique textural surface. My journey with fiber began in the late 70's. Macrame and Woven Fiber Sculptures were the rage until I discovered looms. My passion is with floor looms and making items for the home. I weave everything from rugs and table runners to wall hangings and dolls. Picking out a pattern, choosing yarns and colors is an excitement that I love to share. Listening to the music of the loom as I weave brings me an inner peace. I have the best of 2 worlds: Weaving on my own looms and the antique looms at Historical Roscoe Village.